How do I set up an Amazon Echo in Australia? I live in Australia and recently ordered an Amazon Echo. As the Echo isn’t officially released outside of the US, it requires a few additional steps to get things working — however it works quite well, with the exception of a few features. This works well enough for developers who want to start developing for the Echo ahead of the inevitable Australian release some day! Here’s how I set everything up. UPDATE: It’s coming officially in 2018! Amazon has recently announced that the Echo is coming to Australia and New Zealand in early 2018! So if you’re not in a rush, it might be worth waiting a little longer! 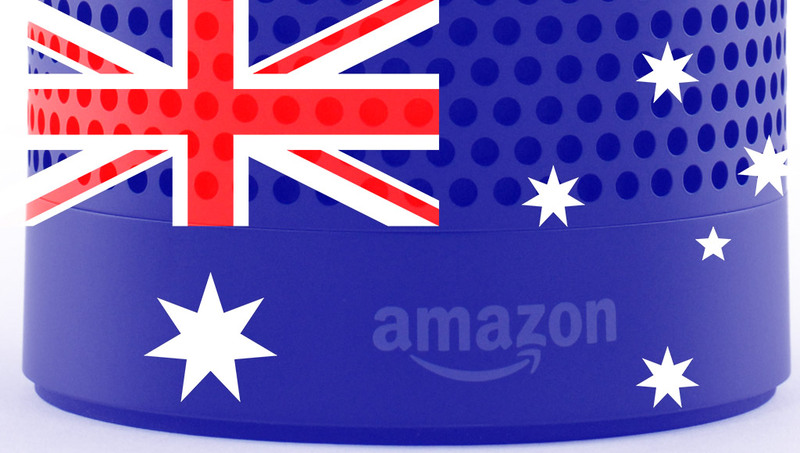 Amazon won’t ship the Echo to Australia, as it only ships them to US addresses. Due to this, I used a service from Australia Post called ShopMate which gives you a US address to send the package to. Once you send the package to that address, ShopMate will forward it to your Australian address for an extra shipping fee. Shipping the Echo from the US to Australia cost me an extra AUD$52.75 — expensive but not terrible considering the Echo ships domestically for free (so I was still only paying one shipping fee in the end). Viabox – I use these guys for a free US postal address, they’re brilliant. They are similar to the Australia Post service, however their shipping price seemed to be a bit higher for the Echo at the time I checked. Shipitto – I have used this service in the past and they’ve been quite good. Not sure how their pricing compares! Do you have a service you’ve used which is cheaper than the above? Get in touch, I’d love to add it to the list. Once you receive your Echo, it needs a power adapter for the US outlet to work with Australia’s sockets. I already had one lying around the house, however if you need one, this is the sort of plug you’ll need (Officeworks). I’m definitely no electrical expert, so please seek expert advice before doing this if you are unsure. I can only speak from personal experience on this one! The way to change your Echo to an Australian address has changed as of November 2017! Here’s the new, new version! We’re likely in the home stretch here — Amazon should be opening up shop in Australia by Christmas, hopefully bringing along their Echos officially by then. 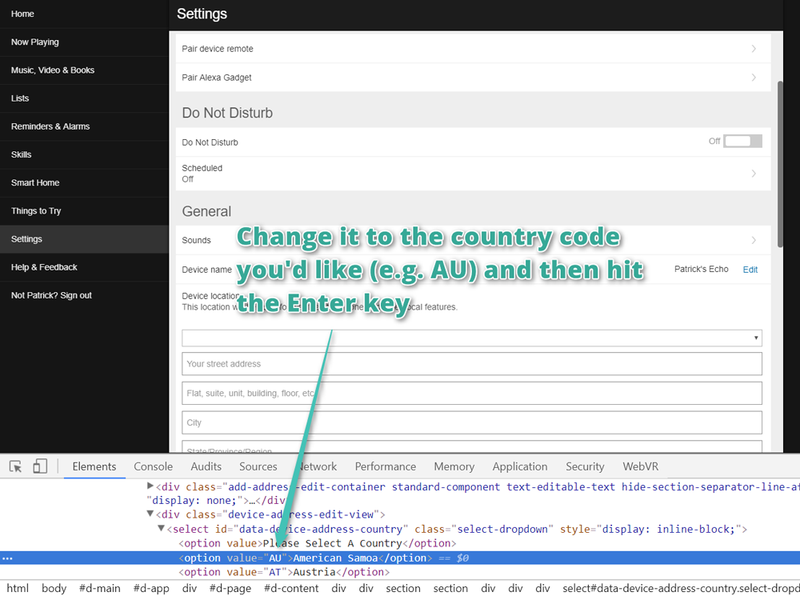 So if you’re thinking of developing Alexa skills for the Aussie market… get building! Now is the time! We’ll now have an updated dropdown which lets us choose our country! Take note that this is only temporary — if you refresh the page, it will go back to normal, so don’t refresh the page yet! 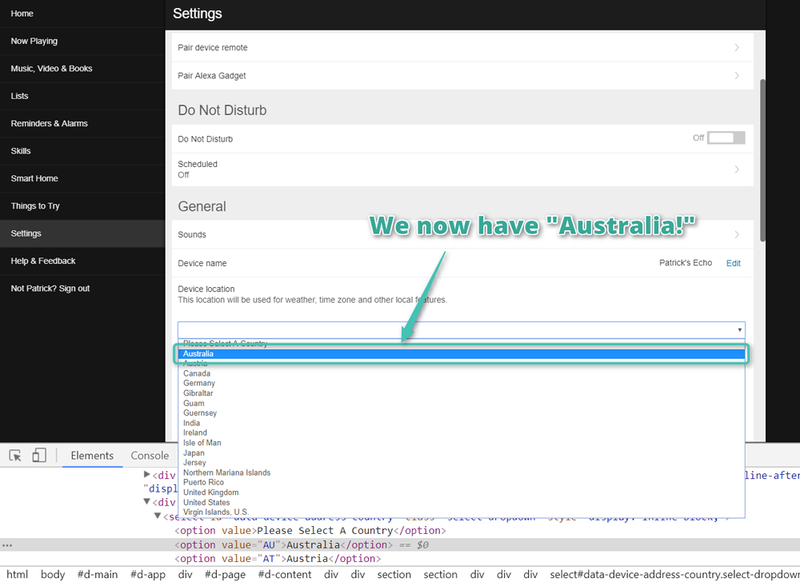 We now have Australia in the dropdown menu! Choose your new country and then enter in your address below it. Then hit “Save”! It should successfully save your new address! 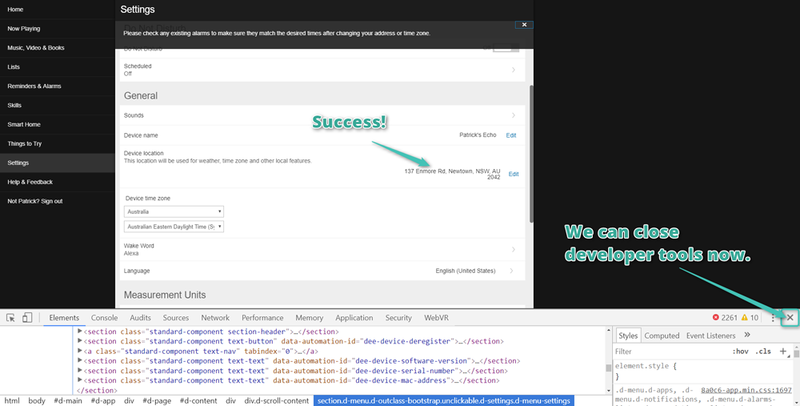 Feel free to close the developer tools with the X on the bottom right. Please check any existing alarms to make sure they match the desired times after changing your address or time zone. If you see that message, it appears to have updated everything successfully! EASY! What used to happen with the address? Remember… if your Echo is working now, you don’t need to worry about any of the below. Not in Australia and wondering if it’ll work for you? I’ve got a growing list here of what countries the Amazon Echo supports for local addresses! Let me know if your country isn’t listed there and it works for you! Important Update! It now appears that only the timezone of your Echo can be changed to one outside of the US. Changing your whole address for other functionality no longer works as the Echo filters addresses to only allow ones in the UK or US. I will update my two Amazon Echo posts if I come across a way to get it working again but because this is on Amazon’s server end… it might be tough! We may have to wait until the Echo goes more global, which I hope will happen soon! 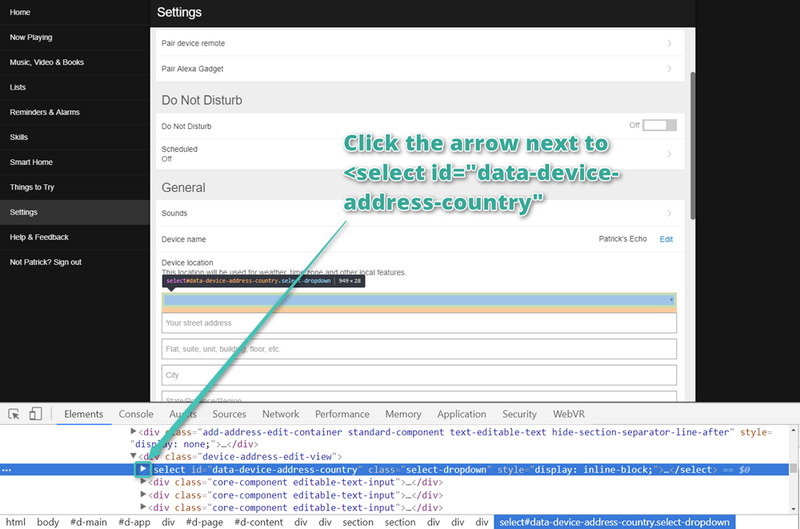 If you end up getting the “User-entered device address and validated device address are not consistent; address will not be saved” error — that is the reason why, it’s not you doing anything wrong on your end! I have a method which uses cURL instead, it suffers the same difficulties around not being able to change the address though: How do I set the timezone of my Amazon Echo to outside the US? CAUTION: There has been at least one case of someone no longer being able to use their Echo after attempting to make this work. If you do some of the steps below incorrectly, or if Amazon changes something, there’s every chance you can stop your Echo working. Be cautious. Most recently, it appears Amazon may be blocking this setting change altogether… so this may no longer work for you. Let us know how you go with it! Remember, everything below this point is likely not to work any more. If you spot a way that does, let me know in the comments! I’ve been trying to find a new way but so far no luck. To start, you’ll want to download and install Request Maker for Google Chrome. You will need this to adjust your timezone soon. it’s easier to install it now before you move to the next step (thanks to KMF for pointing this out!). Conveniently enough, you don’t actually need an app to be able to set up your Echo. If you go to alexa.amazon.com, you can go through the whole setup process on a computer in your home network (or potentially a phone). If you’d prefer to have the Amazon Echo app, you can sometimes find it on the web as an APK if you’ve got an Android phone. It appears the old link I had no longer works though. If you know of a better place to get the APK, get in touch! The Echo can be set to an Australian timezone, however it requires a tricky workaround! Many thanks to David on this Amazon Echo forum for coming up with this solution and Tony Vid in the comments for improving upon it! If you haven’t already, make sure you have installed Request Maker for Google Chrome. This is needed to detect and change a PUT request which otherwise isn’t possible in the Echo’s web interface. timeZoneId – You can find your timezone in this list. Mine was "Australia/Sydney". This is the main one you can change to solve many of the clock issues. Make sure you keep the capitalization exactly the same as in this list, copy paste it exactly as it is there. Make sure you include the double quotes around the value! You’ll update these values and click “Send”. If you receive a 200 response — it worked! Otherwise, try adjusting a few more values. Don’t edit them yet. Look ahead to after the screenshot below for the updated magic order that was discovered! Throughout this process — keep deviceAccountId, searchCustomerId and so on the same — these are unique to you! This is section is an update made on 8th July 2016, thanks to Tony Vid in the comments! 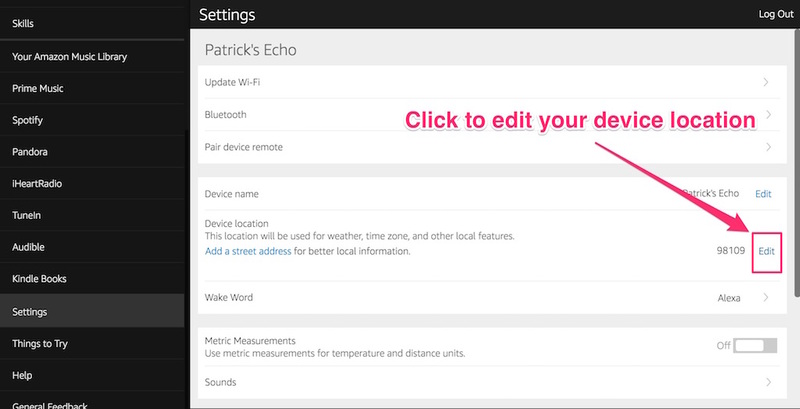 In order to have everything save correctly on your Echo, Tony Vid uncovered that there is an order which might ensure everything does actually switch over to your local timezone. 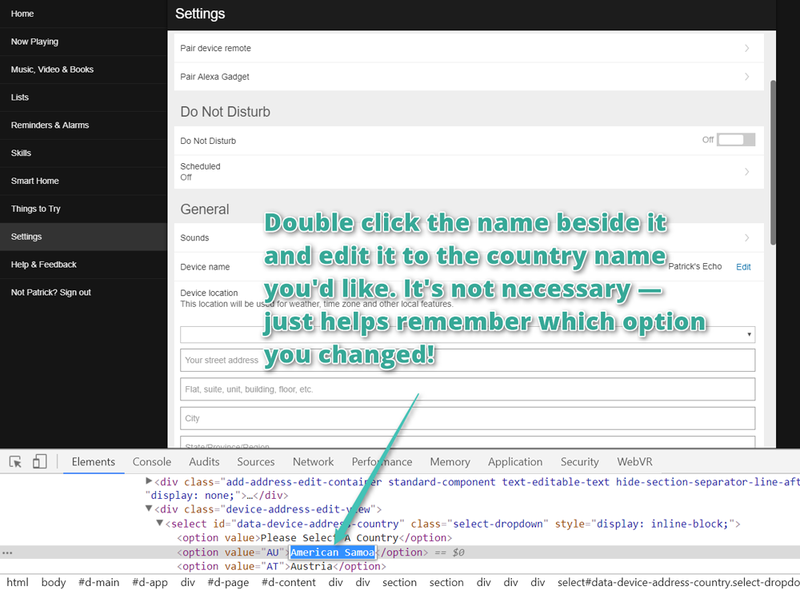 Important: Do not change the label value at any point! Firstly, set your timeZoneId, leave everything else as is and hit “Send”. Press “Send” to send that value. In the end, if that all works, you’ll be able to ask the Echo “Alexa, what’s the time?” and receive the right time. You’ll be able to set alarms and such accurately which is also pretty useful! I’ve double checked this process and it worked 100% for me too! We still need to wait for Amazon! There’s a lot more still to be actually released from Amazon — a few of the address specific functions and Amazon Prime aren’t available. Fingers crossed Amazon release the Amazon Echo officially in Australia soon! Got more questions about the Echo? Like, Is the Amazon Echo always listening? How does it work? Does it store its recordings? If so, can you delete them? Does it really only send audio to Amazon after hearing the wake word? I’ve got a detailed look in this article here. You can use the power supply that comes with the Echo, just bend the pins using a pair of pliers to be angled like a normal AU plug. Slow and steady so you don’t crack the plastic casing. The power supply is rated for 240V usage, so its not a problem at all – just make sure to have the pins at the top of the unit when bending, don’t bend it upside down. Oh neat! That’s a good option for those a little bit more adventurous with their appliances than me 😉 I’ll stick with the adapter — but it’s good to know that there’s no danger in it as they’re both rated at 240V. You can sign up for an us amazon prime account – then with a VPN you get everything that’s available in the states. I have a vacation house in Florida so having prime in both locations makes sense. Interesting! I’ll have to look into whether it’s feasible for me to get a US payment card in Australia. Chances are high I’ll end up living in the US at some point, so it’d be good to have one ahead of time (and it would be useful in situations like this!). One question Jonathan — do you need to have your VPN running for your whole home network for the Echo to play Prime music? Or just have a VPN when signing up for the service? I’ve just set up a new Fire TV here here in Australia which comes with Alexa and seems to have similar issues. Setup want flawlessy and the device was already registered to my US Amazon account. 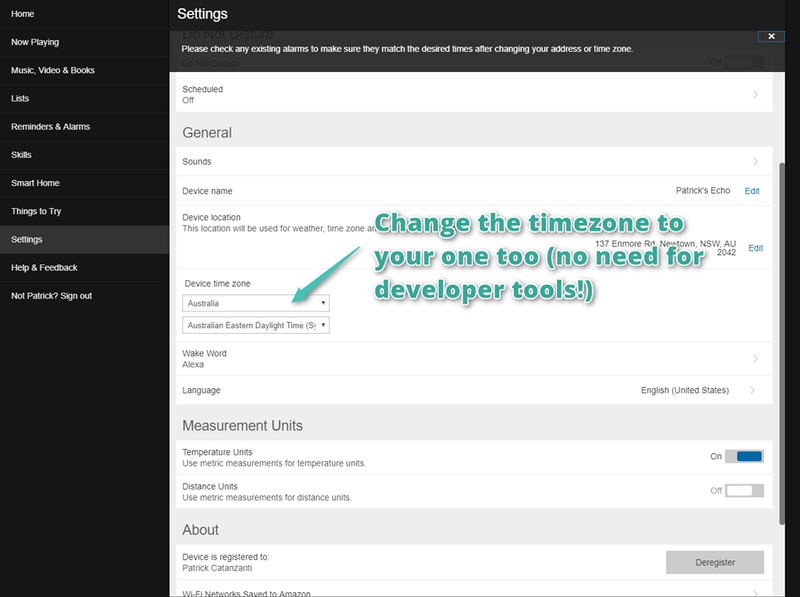 The time zone issue did arise but was very easily fixed via an app, TimeZone Changer. I installed it on my phone from the Play Store and backed up the apk. Everything works, even Prime Music. Despite the fact that I don’t have a US Credit Card on my Amazon account, nor did I use a VPN. I am using Unotelly, a smart DNS service, on my home network which certainly did bot do any harm. Interesting! I think Prime Music works as long as your Amazon account is one registered to a US address? Legendary. I first found this blog through David’s but this is a much easier version for noobs. Thanks so much for putting this together – Alexa is up and running in South Africa. Just one note – you need to have request maker up and running before you log into the Alexa site, otherwise it doesn’t record any requests and just leaves it blank. You can log out and log back in – that worked for me. That’s a great point actually, I’m going to update the post so that it mentions to install Request Maker before opening the page. Thank you for the kind words and for stopping by, I’m really glad that it helped out! Im also in South Africa. can you send me a screenshot of your request maker after you changed the values, as im having trouble setting up. Great post, managed to get mine working in Aus too. Any idea how we can get our hands on the Echo Dot? I tried ordering one with Alexa but it didn’t work. Thanks, I did read somewhere that they closed that loophole. I’ll give it a try tough and let u know. Yip. They have blocked that method of ordering it. I guess we will have to wait until they release it through their store. I use it to connect my Home Automation System to the Echo. Works a treat and gives you control of any amount of things. That’s pretty neat! I recently have been using IFTTT to connect anything that wasn’t compatible. This looks like another good choice! To order the Dot …… You need a US billing address in your 1 Click settings. Once you have that you can place your Dot order and pay via an Australian credit card you wish. Ah ha! A potential solution 🙂 Thanks Ken! The Echo Dot will not work as Amazon will not allow the Alexa app to be downloaded in Australia! The fix mentioned by going to Amazon.com always reverts to having to download the Alexa app. Great post! Managed to change my timezone to Australia/Sydney, so now time works. Yet could not change my address to Australia Address. – What Dominos Pizza is nearby? – What is address for Dominos Pizza? – Find the hours for Westfield Bondi Junction? For me, the address change worked for every field but the “label” one. It has worked for queries like “How do I get to Bondi Junction station?”, giving me directions from my house — though only sometimes. Sometimes it defaults back to a US address when working it out which is strange! I just tried this but am unable to get the “put” field to appear in the request maker drop down list. Has anything changed to prevent this? 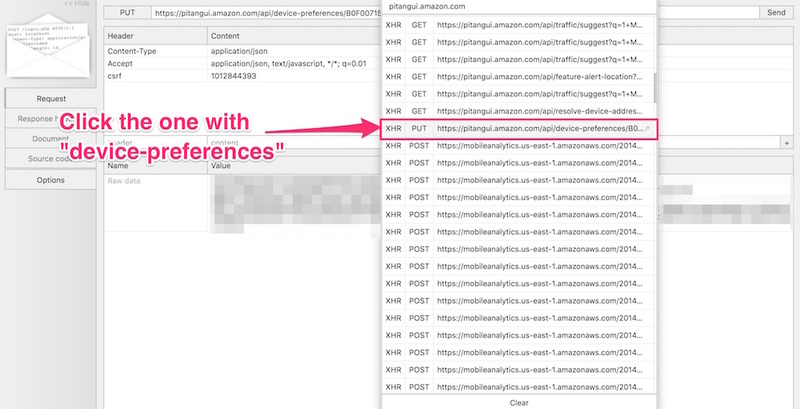 It actually does look like Amazon have changed how this works in the Alexa web app. I’ll see if I can find a new way to do this! 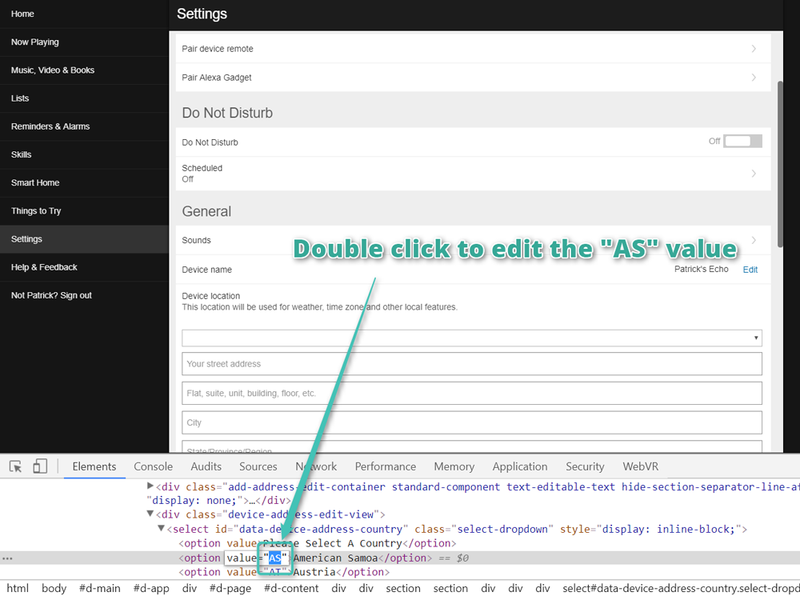 2, In the “extensions” settings (of Chrome) to allow “Direct URL Access”. When i change the street address, i get a URL with cached=true in it. And it doesnt contain the content (PUT) like i should have. Cleared the Chrome cache, but it remains the same. Any idea? What cache is it using? Great work guys, I was able to successfully change the label field to a Australian address and was returned a 200. I was also able to ask for the closest Dominos and ask where am I with a valid/accurate response… However if I ask Uber to give me a ride, it states the address hasn’t been set in the Companion app – interested to hear if anyone in Aus got this working. For those who are populating the null fields – you need to remember to add the “” or you will get a 400 bad request. Its a shame about the Audible app – I have a few books in the audible.com.au but none in the audible.com – so my list is empty. Hopefully they release this in Australia soon! I’m pretty lucky in that I joined Audible before there was an Aussie store, so my account is a US one! Finally updated the second post code LAST, hit send. DO NOT change the Label. The Label will update itself based on your input above. Weather and asking for nearby restaurants all work. Asking for my location also gives me the correct information. I haven’t had a chance to check over the steps personally but because someone else has verified, I’ve updated the article with your steps in the hope they help others. Will try it out myself soon 🙂 Thanks Tony! Just double checked the process myself and it works super duper well, even using my cURL method in the other article. Fantastic find! 1. 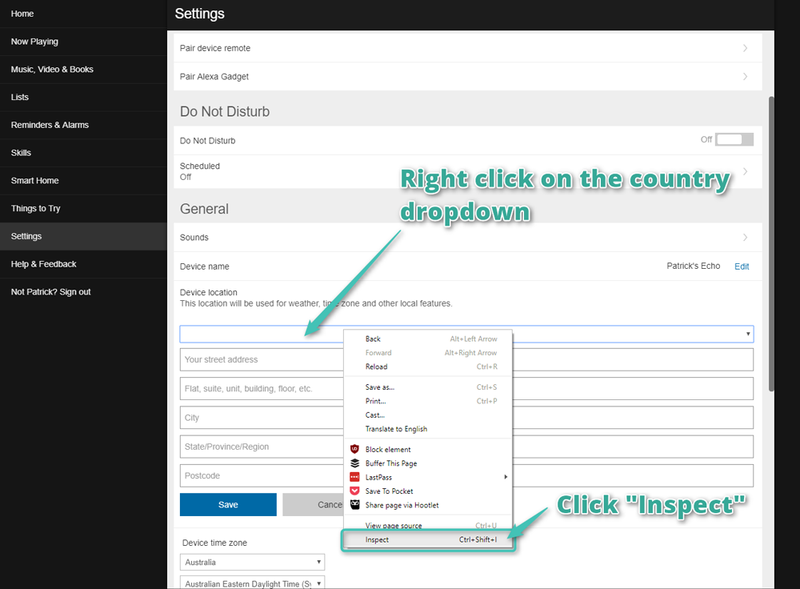 In the “extensions” settings (of Chrome) to allow “Direct URL Access”. 3. 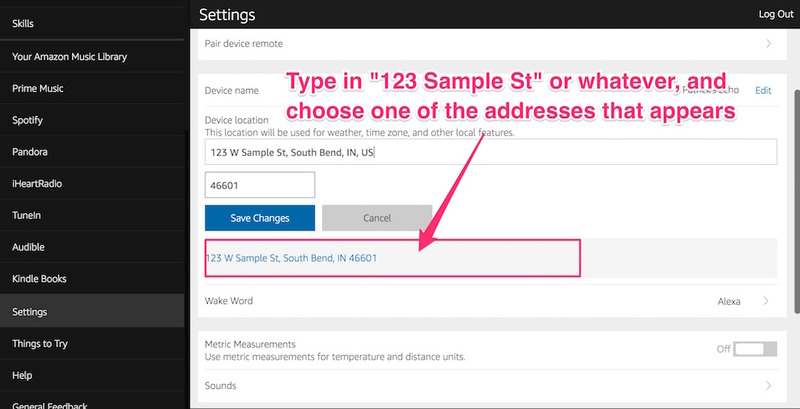 You need to edit the address first to get the PUT field. 5. Restart Chrome a few times and patiently try a few times. It works. Excellent! Thanks for those tips, I hope they help anyone having issues with Request Maker who doesn’t want to go the cURL route. Yeah good suggestions Amz. I was tearing my hear out wondering why sometimes Request Maker wasn’t logging anything. Had a ton of tabs open so it was very intermittent. I found uninstalling request maker, then reinstalling seemed the most reliable way of getting echo PUT to show up. I wonder why that’s the case… It’s something good to try if anyone is having similar issues. The new method of changing address from Tony Vid worked for me in UK. I did struggle for a while until I used the “countryCode”:”GB” instead of “UK”. The request maker can be a bit difficult at times, a few of the comments above have some potential ideas of how to get it to kick in as it’s supposed to. I managed to get the request maker to work by opening it in a new window (too many tabs on the existing one), and I could find the PUT request. I wasn’t able to do the same if I tried changing Settings > Traffic. Would be great if we could change the ‘from’ and ‘to’ locations to non-U.S. addresses! Well I have a major problem after making a couple of seemingly successful changes with this method. My DOT now does not work. I changed the time zone ID and a couple of the next parameters and got the 200 response each time. When I asked for the time it was still the US time though. I tried doing the process again and things went wrong. Now when I ask a question like whats the time the wake word works, the blue light ring works but there is no voice response at all and after about 5 seconds she says “sorry the connection is lost”. After that if I ask more questions I just get the blue ring then 2 seconds later the orange ring and no voice response at all. I did a full ‘paper clip’ reset and set it up again seemingly successfully but it still does not work, it still has the same problem described above. The first question gets the ‘sorry lost connection’ response then no response after that except the blue light ring works (then the orange one comes on briefly). I’m slightly devastated, I wasn’t expecting to brick it. Can anybody help? Sorry to hear it… That’s so strange and not good at all! However, I actually was experiencing a similar constant response of “sorry lost connection” series of responses from my Echo yesterday (without having changed anything)… so *maybe* there’s a bit of an issue with connecting to the server from outside the US at the moment? A few of my requests to it went through, but most were responded with a lost connection. 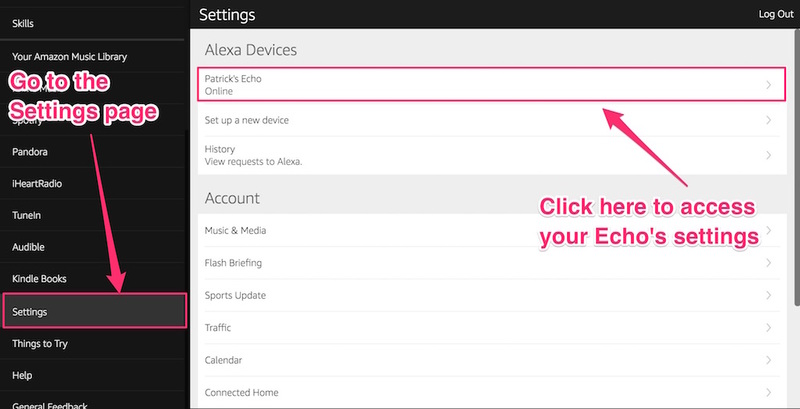 If you go to http://alexa.amazon.com/ and look at the “Home” page in the settings, does it show any voice commands you’ve attempted with it recently? When you reset the Dot, did you also change the settings via the http://alexa.amazon.com/ settings page back to US settings? Hi Patrick, thanks for replying. In the home page of the app it’s not recording the commands since it ‘broke’. I have reset the Dot so many times now I’m not sure if I changed the settings page at any stage. I know I tried to reverse things I did in request maker and ‘send’ tehm back to normal but I may not have done anything in the app. What I can tell you is when I use another Amazon account to set it up it works perfectly in ‘US’ mode. I just spent an hour and 10 minutes on the phone with tech support and near the end of it they found the US post code didn’t match the rest of the US address and they changed it on their end to match. Then we tried a voice command and Alexa responded correctly with the time (US time) but just before she finished the sentence it went dead again. When we tried again there was no voice response again and it never came back. Tech support gave up and said the solution is to use the other account that works and connect the malfunctioning account using the ‘family’ account feature and then tell Alexa to swap profiles to use the malfunctioning account, if you can follow that.. So no proper solution yet. I didn’t tell tech support I had been messing around with request maker, figured that might have ‘voided the warranty’ so to speak. But it must be to do with the account settings being messed up when I used request maker. I asked them to ‘wipe’ the account settings clean to start fresh but they didn’t really respond to that and it didn’t happen, if it’s possible anyway. So what do you think I should do? I would like to get it working properly since it is proven to work by everybody else here. Ahh it’s 1 in the morning and I am tired, just realised the ‘family’ account work around is only going to get it working in US mode again, its not going to achieve the required result of having it give local AU info….. So I have to figure it out. This is pretty concerning, I was looking at ordering an Echo to Melbourne in the next couple of months. If the RequestMaker changes brick it, then it will be a no-go for me. Fingers crossed you can get this one figured out! I checked my Echo this morning and it’s working 100% with the Aussie settings I put in a few months back (no more connection errors), so it sounds like it might be isolated to your Echo Dot somehow. 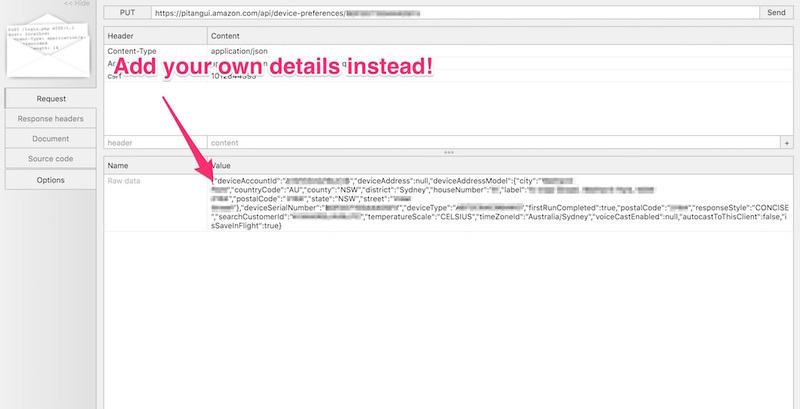 Without being able to see Amazon’s system and know exactly what’s happening, it’s hard to know what the problem is. If I was in your situation, I’d run the settings app and set it all to US address in the app itself. Then save it. That *should* reset it to those settings and it should work with US mode. That at least gives you some functionality. However, if there’s something else that’s been messed up which even the tech support can’t work out… I’m not sure what you could do! It depends on how willing you are to continue trial and error with the risk of causing it not to work again :/ I’d set it all back to US settings and then try again with the steps above. I’ve no idea if that’d cause the same error again though! Maybe wait and see if anyone else comments here saying they’ve successfully changed their Echo to local settings, just in case it’s something which is no longer working (maybe Amazon have changed the functionality of how the settings updates work?) and those who’ve already managed are just lucky that the settings remain but new settings might be impossible to provide? OK here is the latest development. Patrick when I finished with support last night the Dot WAS set back to USA details with the help of tech support and it still would not work in the account I messed up (call that account A). HOWEVER in another of my accounts (account B) it works fine in US mode. Now, it’s 24 hours later and I have just turned it on again after being powered off since last night and – it works in US mode in account A! (as well as B as it always did). So now everything is working as it should again in standard US mode by the looks. I am going to try again to get into AU mode with request maker but this time I will use a throw away account in case the account gets screwed up when I change things. Good luck mate! Waiting to hear how it turns out. Theoretically, that method should do the exact same thing as Request Maker though. Either way, we’re doing stuff that isn’t supported by Amazon, so it could stop working at any time and it’s super tough to diagnose why! OK I set up a new Amazon account with my real AU address in it. Then set up the Dot using this account. The Dot worked first time in US mode saying it is in Seattle. I followed the ‘magic order steps’ above except I forgot to change the street in part 2, so I added it in part 3. Each step I got the 200 response first time. When I looked in the Alexa app where it previously listed 123 Sample Street atc. as the basis for location and time it now said my real AU address. So I was pretty excited about that. However when I aske Alexa for time and location she still reported Seattle as before. Tried a few times for a few minutes with no change. So I powered her off for a minute and plugged her back in. It went straight back to the problems I had yesterday – on first command she did not respond for 5 seconds then said “sorry your echo dot lost its connection”. Then any further commands just get silence (the light ring recognises the wake word). So it’s back to where I was with her being mute again. I guess getting my address in the app is a step forward, maybe. I am going to see if anything changes overnight and I miraculously wake up to a working device but I’m not hopeful. Just a quick update I plugged it in 9 hours later and there was no change. Has anyone been successful with this method since August 5? If somebody tells me yes they have I will keep trying to get it to work. If nobody has been successful since then it may indicate it just doesn’t work anymore. Please let us all know if it has or hasn’t worked for you since August 5. Yeah, it sounds like that’s what’s gonna give the best indication here. It very well might be that Amazon has changed something on their end… if you’re reading this comment and you’ve successfully set up your Echo using the steps above after August 5th, comment here and let us know! Is there a chance it is a problem with the Dot only? Being the newer product they may have made some changes to the firmware that aren’t present in the older Echos? Following up, it turns out that it’s working now! Just gotta be careful in putting the timezone value in with the same capitalization, and potentially not including the district. I think it’s possible the Dot could in some way be different so I wouldn’t rule that out as the cause but 1. I think it’s more likely they are the same as the echo minus the internal speaker and 2. I am pretty sure I have read elsewhere that Dot users have been able to localise them. I believe they both work the exact same way as it all goes back to Amazon’s server which does most of the grunt work. Good news, I got it to work in AU mode. Long story shortened I tried starting from the beginning again and changed just the time location ID as usual. I had previously always used upper case (I saw it written somewhere like that, and the temperature field next to it is in upper case) and this time I tried it with first letter capital then lower case for both words – straight away I got the correct time. With upper case it did not work. Next I followed the ‘magic order’ and the one change I made to it from previous attempts was to leave district at ‘null’. Previously I had been following the screenshot in the post above of the actual settings that had been proven to work (which show ‘Sydney’ as the district) so I had been putting in my capital city. Those two things are all I changed and it worked. So I don’t know if it was just the time zone ID that was the problem, or that AND the district. That’s great news! In future I really should request to see what the person is posting up as I think it’s almost definitely the fact that you were sending the timeZoneId as uppercase — I’m pretty sure that Amazon’s backend just compares the string and would expect it to be the same capitalization as the list of them that I linked. Happy to hear it worked, I’ll add a bit to the post saying that the capitalization needs to stay the same as in the attached link with JSON data values listed. Well done on working that out. I’m planning on joining the Echo community in October, so I’ll be applying the learnings then. Hi. I’m in Auckland and trying to set this up. Could you possibly share your city:, county:, district:, and state: entities? I can get my suburb in (as City) but Auckland does not appear so while local restaurants work, weather does not. and it tells me the correct time, weather and adds calendar events to our house shared Google calendar on the correct day and time. ‘Nearby’ also works a treat. Wanted to add my experience here. I’ve set up 2 Echos in New Zealand in the last 5 days using the Request Maker method outlined above. Request maker can take a few times to get the right request but stick with it because the method and order works perfectly well. Its pretty amazing to have Alexa go from telling you about weather and local restaurants etc somewhere in the US to your own location. The instructions in this post are easy to follow and work well. 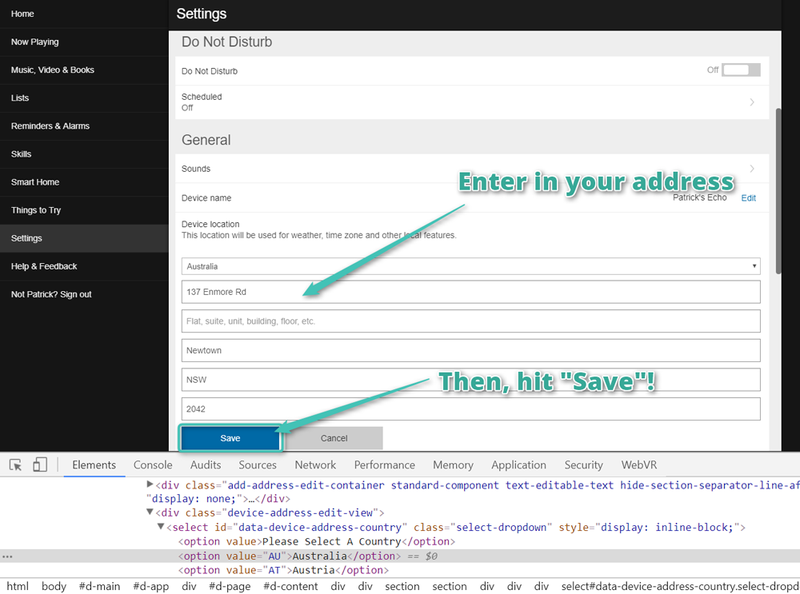 It’s especially fun to get tinkering with the API, making your own custom functions using IFTTT and so on. Give those a go too! Worked like a charm. Even the label update worked. Thanks all. Wonder what else could be done through this method. Fantastic! Glad to hear it worked out 🙂 I’m not sure if much else is blocked on Alexa’s settings that this would solve but if there are things, it’s entirely likely this would work for those too. Hi, i can’t seem to get it to work. Every time i press ‘Send’ it comes back with “400 Bad Request”. Anyone know what i’m doing wrong? Could you share the values you’re sending through (just without the sensitive identifying bits)? Since I last posted in August I’ve successfully set up several Echos for other people in AU without a hitch. The last one was about a week ago. Trying another one tonight and I can change the time zone OK, but when I do the city/county/country/district/house number it comes back as a bad request 400. I’ve tried it many times, resetting, starting from scratch, having just a couple of tabs open but no success. I’ve done this successfully a dozen times now so I don’t think I am doing anything differently (incorrectly). I noticed in the other thread here somebody else has had trouble in the last couple of days. If you’re reading this and you’ve just managed to set up your Echo’s timezone today — let us know. Would be great to see if it’s working for anyone. Otherwise, we may need to wait for Amazon to officially move into more countries. It’s moving into the UK and Germany, so hopefully others will come quite quickly. Especially if Google Home is released in more countries like Australia, might be good reason for them to release the Echo here officially too. Sadly me too. Looks like Amazon might be starting to block these requests? My DOT has firmware 3731 for reference. Thanks everyone for this, the issue is obviously topical as daylight savings started today in NSW/Victoria so using Guam (96910) no longer works. I can confirm that I got this to work today. I followed the instructions, installing Request Maker and then logging into the Alexa settings. I changed the address and Request Maker showed a list of requests but none of them were PUT requests. I tried changing the address to a few different US addresses but saw no PUT requests. I therefore uninstalled Request Maker, quit Chrome, reinstalled Request Maker, went into Preferences>Extensions>Request Maker and ticked “Allow access to file URLs”. I then re-started Chrome and went back into the Alexa settings, change the postcode again and then the PUT request appeared. I initially tried to make all the changes at once and got a 400 (bad request) error so I hit back on the browser button to get the original, unedited request back. I then, as per the later instructions, just changed timeZoneId to “Melbourne/Australia”. I then hit send and got a 200, request sent message. I then tried to sequentially change the other values as suggested above. For my address, it was ambiguous what to enter. I don’t know whether to add my suburb, my local council area name or just “Melbourne” to the various values. I tried a few different options but kept getting a 400 bad request error. Given the problems that others have tried I decided to stop there and see if just the time works. I’m happy to report that it does. I did this successfully on both of my Echoes. They don’t know my exact location so I still have to say “What’s the weather in Melbourne, Australia”. I’m ok with that and with not having the other location-based features available as I’ve not been using them. I mainly use the Echoes to control all of my LIFX lights and as an alarm. Many thanks to everyone that contributed to this fix. Sad to say that after settings up Echoism.io to work in NZ on the 19th September, attempting to configure a V1 Dot today is not working using Request Maker and the Magic Order. Timezone ID is returning 200, everything else 400. That’s a shame :'( Here’s hoping Amazon releases it globally soon then… or we find a new way to get this running! At least the timezone is still working! I concur, I have just tried these steps in the last half hour and could only get the timeZoneId set, I cannot set any other details. I get 400 Bad Request. For those interested, I also got this message. Also hope that this changes at some point in the very near future, would love to use all the other features in a local Sydney context. That aside, great article, thanks for taking the time to write it up. Yeah, it seems that Amazon had added a step to their address saving process that stops this method from working… Hopefully they’ll open up access to more countries soon or we’ll find a new way to work around it! I am now worried though that I may not get it to work. I have read somewhere that amazon has included all US Army overseas post codes to their US list. I have found a list and (strangely enough – there are 2 post codes for Sydney, 96209 and 96211 with a country code of AS – not AU ) Would this possibly help anyone? I also have the codes for Melb Canb Woomera Exmouth and Alice Springs if anyone wants them. I just hope this can be of help to anyone. Go easy on me if it doesn’t help. I am new to this and I don’t even have my echo yet! Pretty sure. Most times when I attempted to edit the label in the past, it caused the whole thing to fail. However, recent events have changed how they verify it, so maybe now it’s worth giving that a shot. Let me know if you find success with it! Can you at least change the timezone though? Just got a new v2 Dot. Unfortunately as per XBMCNUT, I was able to change everything after I set the label to null. Trying anything in the label always returned 400 bad request. I tried US addresses, with all of my AU details in the other fields and of course my AU address… failed every time. Only the timezone change returns the right time when asking Alexa the time. My V1 Dots are running software version 4172 (still hold the AU address) while the new V2 units are 561179520. I cant change the timezone to my V2 dots, any help please! Did you put double-quotes around the time zone value? I was able to successfully update time zone on my brand new Dot software version 561179920. That is actually one of the most common mistakes, so definitely be sure that you’re adding double quotes around it! I might actually highlight that in the instructions to be sure people do so. When following the above steps, Request Maker doesn’t seem to log a PUT request of any kind anymore. Has anyone else noticed this? It makes it difficult to edit, when there isn’t anything logged! The request maker doesn’t always seem to trigger for some reason, some comments above give ideas of how to get it to run… maybe! Thank you very much. The cURL method worked, and actually seems a lot easier to me. I wish I’d found that page first. Thanks for the quick response and for offering the rest of us the benefit of your experience with Alexa outside of the US or UK. Yay! Glad that it worked 🙂 Enjoy your Echo with all its wonder! Managed to change the timezone, no luck with the location. Anyone managed this recently ??? If someone could be kind enough to help me set my Echo DOT v2 to Adelaide/Australia time zone settings and also location I would be very thankful!! Right now, even just changing the address isn’t quite working for anyone, so changing the timezone would work for you just like anyone else, the address would likely not work in the end either way right now. Thanks so much for this. Finally set up my Amazon Echo and managed to secure the timeZoneId, every changed after that failed. Hopefully some more updates soon 🙂 Just wish I could connect it with my Lifx, seems to be struggling. It seems the Timezone can now be entered using a couple of dropdown menus that allow cities outside the USA. So no need to hack the code. Hi and thanks for the interesting guide & discussion. I’m in Melbourne and like many others trying to get the location of my Echo right. While I haven’t managed to do this, what I have noticed may be of interest to others and provide some useful clues. Most of the time I tried to tweak the request I’d get a ‘Bad Request’. However, when I followed the order below, all requests were responded to with OK. The bad news is that the location didn’t seem to change even though the request went through successfully. 1. Changed the timezone to Australia/Melbourne using Request Maker, I then checked this at http://alexa.amazon.com/spa/index.html#settings/device/ to make sure it worked. All these went through ok, but the address is still wrong in settings and the echo still thinks I’m in seattle. I know one of the requests worked because the timezone changed. Definitely let me know if you find a way to get it to change the address! Thanks for the feedback, I think the address will require some sort of new approach, but I’m not sure what it is yet! I have just bought a dot v2 and live in Melbourne. Have you got good functionality? Hello, I’m from Sweden and i can say that even if you change to a proposed street and country in for example Germany(DE) it still thinks you are in Seattle. Did follow your instructions peterman and did also get code 200 back but still no change. Has anyone here have the same problem? I’m sorry to hear that. I keep this article here and update it whenever I find a new way that works. I’m surprised that the section on “Setting up your Echo to an Australian timezone (The new way in 2017! )” I added in earlier this year isn’t working for you, it still appears to be working for me. The section on how to order an Amazon Echo is still 100% valid too. The section that doesn’t work is the “Setting up your Echo to an Australian timezone (The old way)” which I’ve tried to make pretty clear isn’t likely to work anymore. I’ll keep this article here and continue to update it as best I can to help. The idea is at least by reading the article you can get a history of what’s been done before and what isn’t working now (and the steps that are). Sorry again to hear it didn’t work out. I’ve put a lot of work into keeping this article as helpful for others as I can. I’ll make it even clearer in the article that changing anything other than the timezone no longer works. Looks like all you need to do now is fill in the correct address in the Alexa app. UPDATE: Discovered it is working after all! Excellent! I’ve updated the article 🙂 Thanks for that find! Hi Patrick, thanks for continuing to update this. Thanks to you I noticed the timezone dropdown updates today and updated all of my devices. However, updating the address field doesn’t work for me. I tried on an Echo, and Echo Dot and an Echo Look and from both the website and via the app. I tried my address (in Melbourne) and yours (Sydney) and none of them work, I just get “Could not set your address. Please ensure you have correctly entered a complete address.” My street is Clarendon St and with some combinations it did suggest an address in the UK. Perhaps it is limited to the US and the UK again? If you’re aware of anything specific in how you entered the information I’d be pleased to hear it. Yep, it appears that Amazon has disabled them all again :/ Not sure why! Will keep an eye out for if that changes! Thanks for all the info. Could you please provide the current status of this? I currently get a message ‘please choose a valid country’ from the drop down box (and Australia is not in the drop down box). Yeah… they recently changed it to the dropdown box… I’m going to look into it and see if there’s any workarounds that’ll help it work but it looks like they’ve got a lot more validation happening now. Here’s hoping it’ll be released in Australia soon with Amazon’s emergence here! Thanks Patrick, you’re a star. My Echoes, Echo nooks and Echo Look all now know I live in Melbourne.